One Friday before Easter, I put on my special yellow Easter dress, with a white knit shrug, white gloves, white patent leather shoes, and a matching white purse. Then Mommy and I drove to Bellevue Square so I could meet the Easter Bunny. The Bunny didn't talk; he just sat there and waved. I knew there was a person inside. 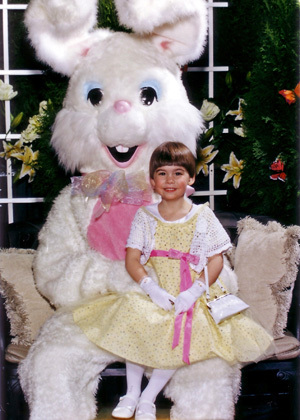 When I sat in his lap [right], the photographer said I had on the prettiest Easter dress she'd seen that day. Lots of ladies in the mall stopped to look and give me compliments, too. Then Mommy and I walked to Harry & David to buy a frosted Easter cookie to eat for a treat. It was a special Mommy & me day. This year Mommy, Papa, and I spent Easter in the Netherlands. We arrived on Saturday, March 22nd, and Easter was on the 23rd. When we woke up on Sunday, there was snow on the ground! It turned out to be the coldest Easter in Holland in 40 years! Even though I was away from home, the Easter Bunny still found me. 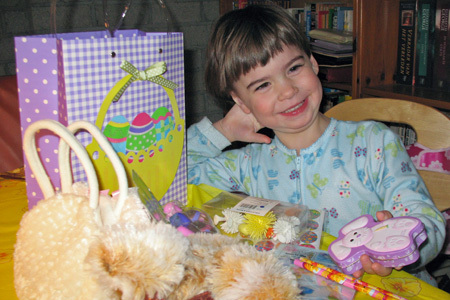 He left me a special bag filled with small toys, a few candies, an Easter purse, and a soft bunny [left]. I liked the chocolates the best, and the bunny slept with me the rest of the trip. Later that morning we went to Hotel Zuiderduin in Westkapelle on the beach to have Easter brunch with Oma and all the family. I had pannekoek and fruit, and later I got a sundae from the dessert buffet. It was really fun to be with all my aunts, uncles, and cousins. I remembered them all right away. This spring I spent three weeks in the Netherlands! Mommy stayed with us for a week before flying back home again, while Papa and I stayed another two weeks with Oma. The first week we did lots of fun things. On Friday, March 21st, Mommy, Papa, and I flew 14 hours to Amsterdam, then drove another 2 1/2 hours to Vlissingen (I slept in the car). By the time we arrived, it was already Saturday! Our second day in Vlissingen was Easter (see above). It snowed the Monday after Easter, too, and we all bundled up in the warmest clothes we had (Mommy hadn't packed for snow in late March) and walked through the snow from Oma's house to Tante Monique's house in the morning, where everyone had slept in late because the Monday after Easter is always a holiday in the Netherlands. My cousins Jasper, Menno, and Maaike took me out in the snow to play. After doing lots of shopping and visiting, Mommy, Papa, and I spent the next three days at Het Vennenbos, a family resort near Eindhoven. In our bungalow, I got to sleep on the top of a bunk bed in my own room. I spent two mornings at "Puk and Pelle Camp," where I made art projects, sang songs, and had snacks. 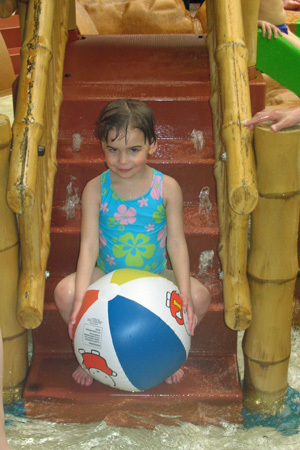 And I spent lots of time in the swimming complex, where I could float with Papa in the wave pool, slide down water slides, and play with my Nijntje ball in the kiddie pool [left]. While we were there, we went one evening to visit Tante Lianne's family, and one afternoon to visit my cousin Jolien in Boxtel. We walked to her graphics school and ate pizza in her student loft. Papa's cousin Carien and her family also visited our bungalow one evening. Thursday night we stayed near Schiphol, and Mommy left on Friday morning. She cried a lot. I was sad to see her go, but not upset. I was also excited to stay in the Netherlands, and they'd explained that I would be going home with Papa soon. I also saw Mommy and talked to her every evening with Skype on the computer. The next two weeks were filled with lots more fun. 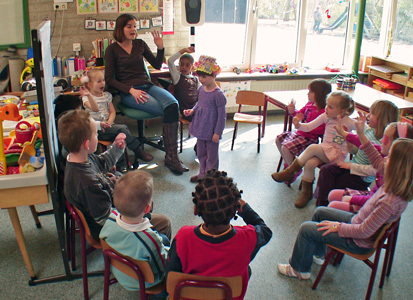 For five mornings I attended preschool at Franciscusschool in Vlissingen. Papa took me there on the back of a bicycle! I was apprehensive the first morning, but after that I had lots of fun. Juffrouw Trudy was very nice. On my last day, Papa and I brought appel kanos to share with the class and a book gift certificate and flowers for the teacher. Juffrouw Trudy made me a special crown, and the class gave me a goodbye party. I went around the circle and said "Tot ziens!" to each new friend [right]. We also went with Oma and Tante Monique's family back to Het Vennenbos for a weekend. It was great fun to play in the pools with my cousins. They had lots more energy than Mommy and Papa! Om Marinus and Tante Tos also visited us there. Back in Vlissingen, the sun came out, and on several afternoons Papa took me to the beach. Even with the sun the air was still cool, but I had a great time in the sand. By the time we left for home on April 11th, I was ready to go. It was an 18-hour plane ride (! ), but I behaved myself. And when I finally saw Mommy waiting for us at SeaTac airport, I ran into her arms and wouldn't let her go. It felt really good to be home and all together again. 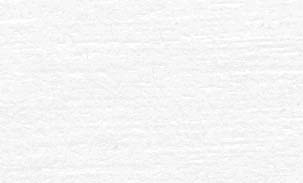 I love snow. And I was especially fortunate because this year Kirkland had the latest snowfall ever on record: I woke up to snow outside on Sunday, April 20th! We ate breakfast very quickly, and then Papa and I put on our snow clothes and went out to play. 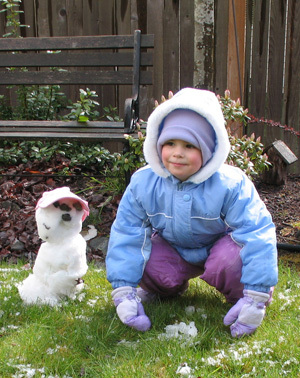 The snow began to melt right away, but not before Papa helped me make a snowbaby [left]. If it were up to me, I'd have it snow all year long! Koninginnedag is on Mommy and Papa's anniversary. That was a Wednesday, and they went out to dinner while I played with Brennan at Scott's house. But on May 3rd, after Saturday morning Oranjeschool, there was a Koninginnedag party for all the students. It was very fun. 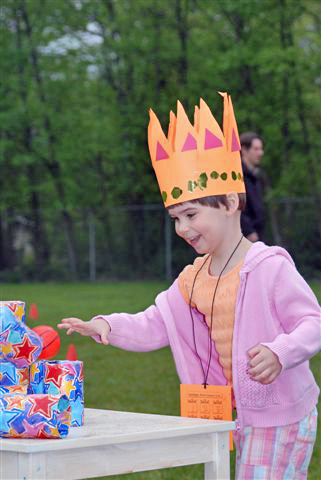 After we decorated special crowns, we played games outside (in the rain) [right]. I also liked eating the special Dutch treats, like sweet rolls with frosting. As part of Mommy's "weekend of celebration" (May 11th was not only Mother's Day but also her birthday), we all went roller skating at Skate King in Bellevue. It was my first time on roller skates! When I got to the counter, I told the skate man, "I need four-year-old skates." He assured me he had them. In fact, he had special skates on which one wheel had been tightened so that they wouldn't roll too quickly. 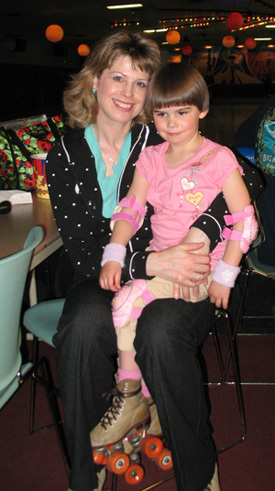 With all my bicycle pads on, and Mommy and Papa each holding an arm, I stepped out onto the rink. I was cautious, but not scared. Pretty soon, I was walking around the rink all by myself! I even tried doing the Hokey Pokey! Besides skating, I also liked the music, the lights and mirror ball, playing at the air hockey table, and eating the popcorn. I want to go back and do it again! On Saturday, May 17th, the temperature reached 90 degrees—the earliest day of the year on record in Seattle. On Sunday, when it "cooled down" to the mid-70s, Mommy took me to Juanita Beach Park to play. When I saw Mommy's warm weather toes, I asked her to make mine the same. 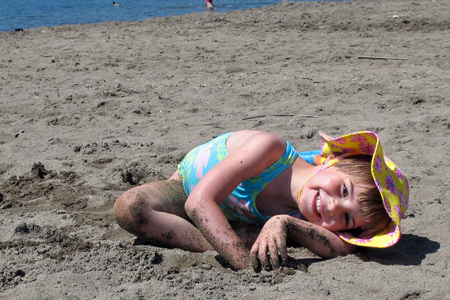 So that morning she painted my toe nails pink, and I wore them proudly to the beach [below].